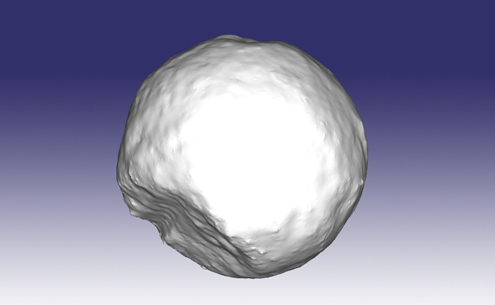 Reconstructing the maximum possible diameter of a spherical bullet using the bowl of an impact scar from St Luke’s church, Holmes Chapel (image: Dr Paul Bills, University of Huddersfield). Damage left by the English Civil War is still evident on many castle walls, church doors and elsewhere around the UK. The study of cannon and musket ball impacts has helped archaeologists and historians piece together a narrative of those violent events, but many explanations rely on conjecture or are coloured by local myth. "During the English Civil Wars many sieges were invested across England. Some actions barely lasted an afternoon while others spanned months, finally ending in the breaking of the siege, the frenzy of a storming or the evacuation of a garrison under terms of surrender. In addition to the rich contemporary historical accounts, the physical remains of English Civil War sieges persist in the English landscape in the surviving architecture and earthworks above ground, and in scatters of artefacts (eg buttons, coins, bullets) left behind by the besiegers and the besieged. My PhD research as part of the wider research agenda of the Arms and Armour Research Group at the University of Huddersfield centres on these physical remains of siege warfare. The aim of the project is to examine some of the physical evidence of English Civil War sieges which has been understudied: namely the bullet impact scars on standing architecture and scatters of lead bullets (and other projectiles) from both in-going and out-going fire during the sieges. 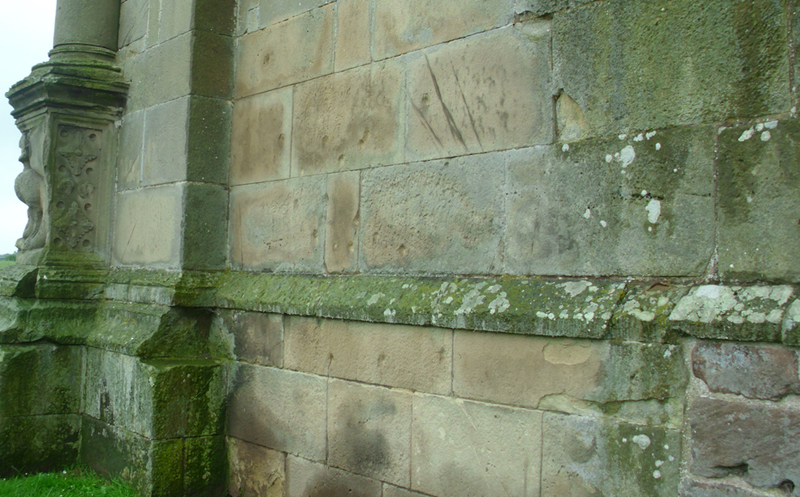 Bullet impact scars on the east wall at Moreton Corbet castle, Shropshire. Bullet impact scars from the English Civil War are found across England. Some relate to urban skirmishes, while others come from siege activity. Inroads have been made to record their occurrence at a national scale, but it is suspected there are many lesser known sites which have not yet been recognised and at some locations the impact scars require verification. During the summer of 2012 I conducted an initial survey of 30 known siege sites to assess the surviving architecture and record impact scars. The sites ranged from the castles at Moreton Corbet (Shropshire) and Ashby-de-la-Zouch (Leicestershire) which display high numbers of impact scars in multiple locations, to those with isolated examples such as Bolsover (Derbyshire) and Skipton (North Yorkshire). The location and number of impact scars aids in interpreting the course of events during a siege, but it is important to emphasise that in some cases (eg Hopton Castle in Shropshire), the original building material may not be suitable to preserve impact scars or they may have been obscured by later restoration work. 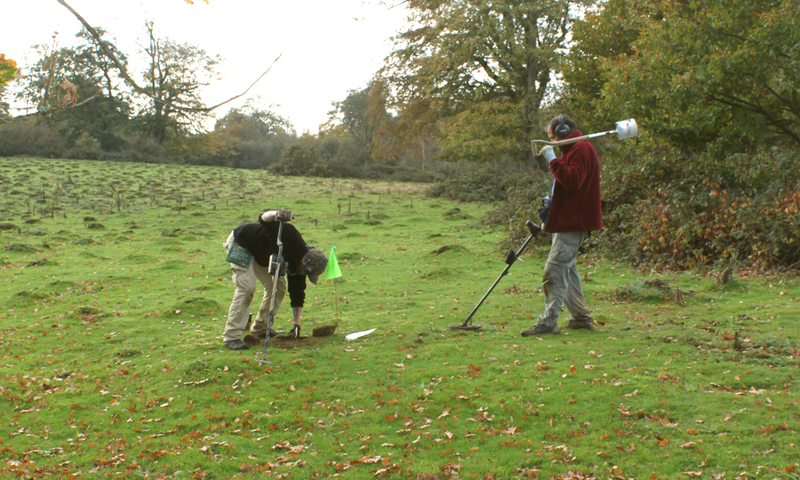 Systematic metal detecting with battlefield archaeologists Colin Parkman and Dr Glenn Foard during fieldwork in Sussex (photo: Emily Parkman). Impact scars are invaluable as they indicate the focus of fighting. Clusters of bullet impact scars surrounding windows on the north-east face of Old Wardour Castle (Wiltshire), for instance, suggest that the rooms beyond held defenders (who were apparently making quite a nuisance of themselves). However it is unclear if impact scars can tell us anything specific about the size of the bullet fired, the velocity of impact (and by extension the range of the shot) and the angle of impact. 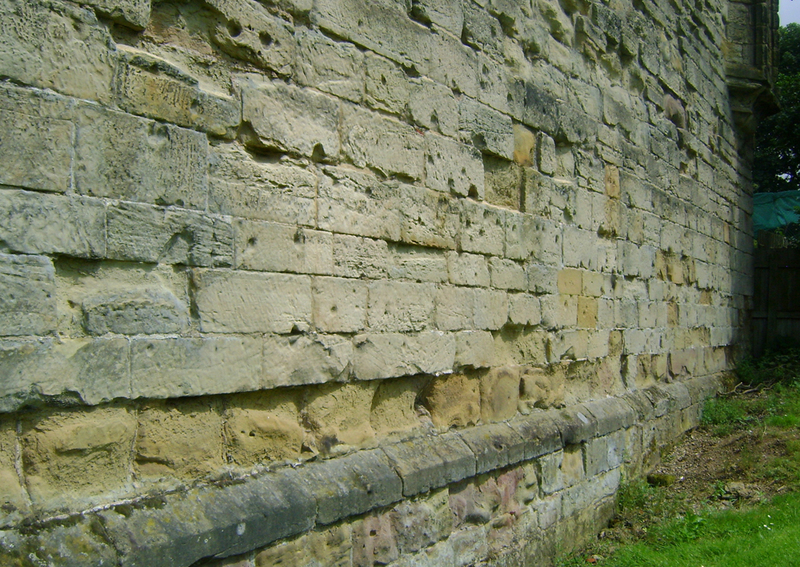 Impact scars on a wall at Ashby-de-la-Zouch castle, Leicestershire. to allow analysis of the dimensions and morphology of impact scars to investigate what they may potentially tell us about the velocity and angle of impact, as well as the size of the projectile causing the impact scar. 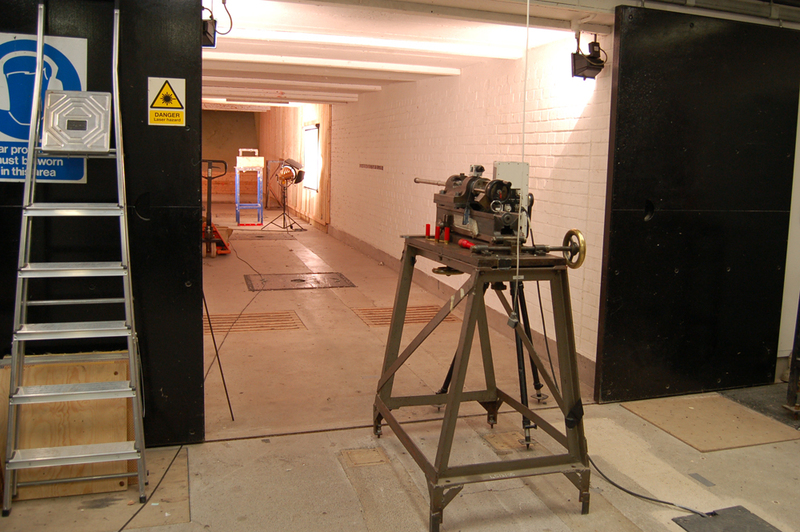 Experimental firing set-up, secured gun barrel (foreground) and sandstone target down-range. Experimentally produced bullet impact scar from a 12 bore musket ball. 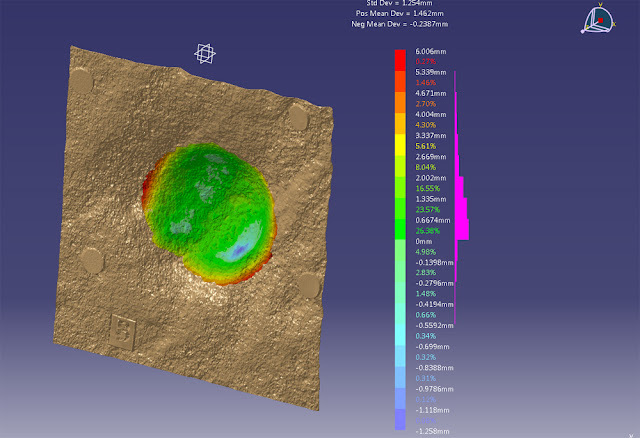 The resulting impact scars were laser-scanned to investigate the variation we can expect from impact scars resulting from a single bore of bullet. These will be used to refine a methodology for analysing archaeological examples, though the effects of variations in building stone and centuries of weathering will require much more additional investigation. 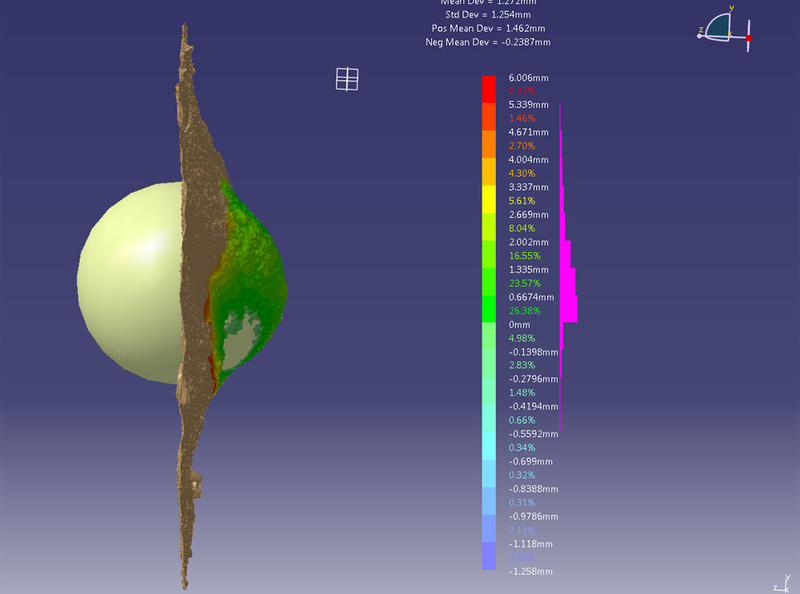 Using computer-aided design (CAD) to map the surface distortion of the bowl of an impact scar from St Luke’s church, Holmes Chapel (image: Dr Paul Bills, University of Huddersfield). 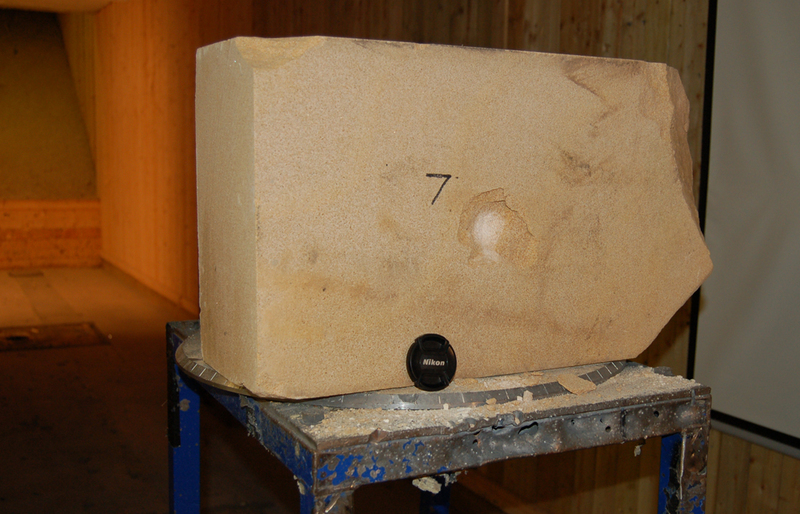 Using the bowl of an impact scar from St Luke’s Church to reconstruct the maximum possible diameter of the original spherical bullet (image: Dr Paul Bills, University of Huddersfield). Sites with no remaining architectural evidence of conflict (be it impact scars, undermining damage etc) can still contain valuable evidence underground. Like recording impact scars above ground, metal detecting to recover bullet scatters gives physical evidence of the focus of fighting and can also provide evidence of the location of besieger’s camps and siege works. Comparisons between impacted bullets (both associated with and in isolation from impacted wall surfaces) may highlight areas where walls have been demolished and ‘lost’ in preceding centuries. Some discrepancies were observed with the results of the three methods in terms of calculated diameter and the density of the bullet (which traditionally are assumed to be ‘pure’ lead for the sake of calculations), which have prompted further research into the effects of corrosion in the soil and earlier distortion or weight loss on firing and impact. 3D laser scan of lead bullet, showing distortion potentially due to melting on firing (image: Amanda Wynne, University of Huddersfield). Radiograph of English Civil War musket balls from Basing House produced during neutron tomography work at the Paul Scherrer Institut (image: Prof. Sue Kilcoyne and Prof. Bob Cywinski, University of Huddersfield). The archaeology of English Civil War sieges is a field where research questions are constantly evolving. I hope that my next two years of detailed investigation will benefit conflict archaeology and heritage management, as well as providing additional information for re-enactors and tourists, and stimulating future research into this fascinating field." Many thanks for Amanda for sharing the progress of her fascinating research. Amanda can be contacted at wynnead (at) googlemail.com or followed on Twitter @mystery_past. I can demonstrate a number of 1645 impacts of musket or smaller bore rounds on wooden doors at Pembridge, Herefordshire, with detached splinters of wood from the door interior, also what may be an oblique impact of a ball on a pier in the parish church. I can attach images if desirable. Can be reached on klein84"at"btinternet.com.